Trading can be daunting. With TradingSim you get the freedom to learn to become a consistently profitable trader without forfeiting capital or taking big risks. Improve your performance by trading real tick data from over 500 trading sessions. Experience trading bull, bear, and sideways markets. Start placing trades with minutes of signing up. 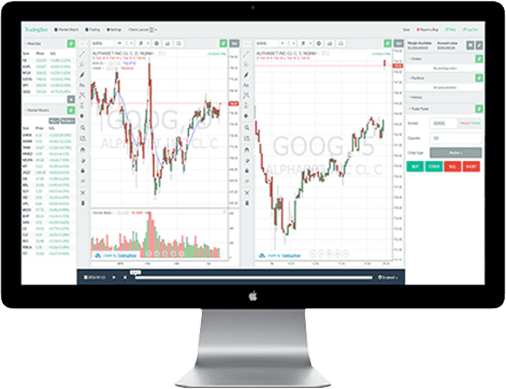 Provides the most active stocks and top futures contracts. In real-time. 2 years of historical tick, level 1, and time & sales data for over 11K+ symbols. Over 60 technical indicators and 30 drawing tools. Simulate a week of trading in less than an hour. Replay Any Trading Day - from the last 2 years! If you are interested in sharing Tradingsim with your followers or site visitors, please complete the form so we can start the conversation. Whether you’re looking to expose your students to trading or customize our platform for your brand, volume licensing can save you money and help you get started.